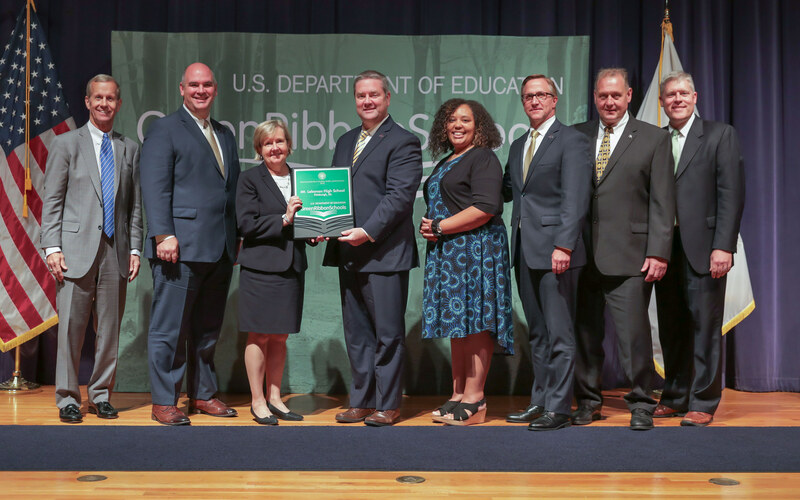 Forty-six schools and six districts were honored on September 19, 2018 at the 2018 U.S. Department of Education Green Ribbon Schools ceremony for their innovative efforts to reduce environmental impact and costs, promote better health, and ensure effective environmental education. Mt. Lebanon High School was selected as one of only two Pennsylvania Schools to receive this distinction this year. The award highlights schools that have engaged in promising practices and as a model for other schools to employ. Representatives from honored schools, districts, and postsecondary institutions received sustainably crafted plaques in recognition of their achievements. "The new high school was designed and employs practices to specifically reduce environmental impact and costs. In addition, through well-designed curriculum and instruction all students are exposed to effective environmental and sustainability education. And finally, programs and practices have been instituted to improve the health and wellness of students and staff in a learning environment that is conducive to achieving their full potential," said Dr. Timothy Steinhauer. "We are very proud that our high school was recognized as a national Green Ribbon School." On hand for the ceremony at the U.S. Commerce Department were Assistant U.S. Secretary of Elementary and Secondary Education Frank Brogan, National Oceanic and Atmospheric Administration Education Director Louisa Koch, Director of the Campaign for Environmental Literacy James L. Elder and Director of the Center for Green Schools at the U.S. Green Building Council Anisa Heming. Representing Mt. Lebanon High School were High School Principal Mr. Brian McFeeley, Superintendent Timothy Steinhauer, Unit Principal Carlie McGinty, Assistant Superintendent of Secondary Education Ron Davis and Facilities Director Rick Marciniak. "Today's honorees can be proud of what they have accomplished in their local communities," Brogan said. "They have reduced institutional operating costs and helped conserve our precious natural resources, while engaging students in authentic sustainability learning in safe, healthy and inspiring environments." "Our children are the hope and promise for our future and an even better future for generations to come," Koch said. "The U.S. Department of Education Green Ribbon Schools recognition awards honor what the students, teachers and staff are doing to make the world a better place." "Over the past seven years, U.S. Department of Education Green Ribbon Schools have helped to define what it means to be a sustainable school and how to effectively offer environmental education, so it's my pleasure to celebrate this work annually," Elder said. "U.S. Department of Education Green Ribbon Schools support students' development into responsible, compassionate and engaged citizens," Heming said. "We applaud these outstanding schools, districts and postsecondary institutions for improving educational facilities to promote health and environmental stewardship, and for ensuring students have an opportunity to engage in real-world learning about the natural environment and the world around them. We also commend the U.S. Department of Education's continued commitment to highlighting these schools' successes through this program."